The new Seat Leon ST is the first time the Spanish marque has offered the Leon as a wagon, which will be the third body style alongside the three-door Leon SC and five-door hatch versions. 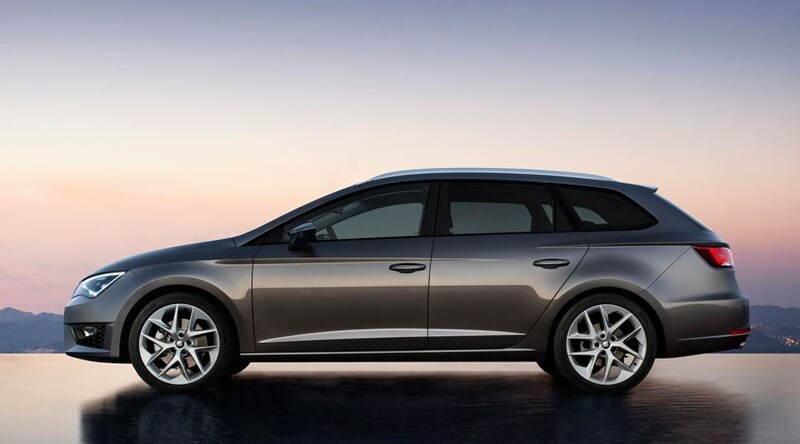 Based on the impressive new VW Golf Estate the Leon ST will be cheaper than the Golf wagon when it arrives in UK showrooms in January 2014. Is it just a Golf Estate with a different look? That’d be selling the Leon ST short, as there are key differences apart from the stylish body and edgier interior. Crucial for many shoppers is the fact that the Leon ST is, in fact, smaller than the Golf Estate, with 587 litres of bootspace that expands to 1470 litres with the rear bench folded. That trails the Golf, which offers 605/1620 litres, but the Leon ST is still much roomier than the Ford Focus Estate, with its 490/1516 litres. Of course, it shares the Golf’s class-leading MQB platform, which means the Leon ST should deliver the inherent sharp dynamics that the hatch offers in spades. The clever packaging also means that it weighs only 45kg more than the five-door model, despite the 27cm increase in length. The ST model line-up is yet to be announced, but the full engine range has been revealed and it appears the ST will be offered in the same trim levels as the five-door hatch. That means an entry level S model with a choice of diesel and petrol engines, starting with an 85bhp 1.2-litre with a choice of a five-speed manual or DSG, as well as a 1.4-litre four-pot that’s manual only. Step up to the mid-spec SE and you’ll also be able to option a 178bhp 1.8-litre and DSG transmission. In terms of diesels, there’s an 89bhp/170lb ft 1.6-litre as well as a 2.0-litre with 148bhp and 236lb ft of torque. The flagship FR will offer a more potent 182bhp/280lb ft version of the 2.0-litre oiler, while there’s also a new Ecomotive model powered by the 1.6-litre diesel for a claimed 71mpg and 88g/km of CO2. And there’s an adaptive chassis? There’s a host of tech offered on the Leon ST, but the most rewarding will be the Dynamic Chassis Control that’ll be optional on the FR model. With multiple modes – Comfort, Sport, Eco and Individual settings – the Leon ST FR stacks up on paper as potent performer. There’s also progressive steering and adaptive cruise control, lane keeping assist and a drowsiness detection system. What about a high performance model to rival the Ford Focus ST? It’s on the cards – Seat top brass are considering a hot Leon ST Cupra model as an alternative to the Focus ST Estate, which has the circa-£25k hot estate market all to itself. The hot Seat would be the closest thing to a VW Golf GTI wagon, using a 2.0-litre turbocharged petrol four-cylinder mustering around 220bhp. With VW insiders confirming that a Golf GTD Estate is being developed, the Leon ST Cupra could go on sale without stepping on the Golf GTD Estate’s toes. If the Leon ST Cupra does make the business case, you’ll see it sometime later in 2014. The Leon ST will cost around £1000 more than a five-door Leon hatch, which starts at £15,670. This means that the Leon ST’s £16,500 starting price will undercut the Golf Estate, Skoda Octavia Combi and even the Kia Ceed Sportswagon.